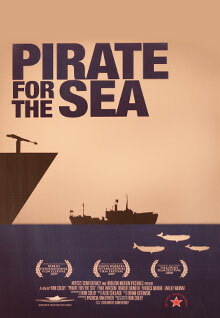 Pirate for the Sea is a biographical documentary on Captain Paul Watson, the youngest founding member of Greenpeace Canada. He organized early campaigns protesting the killing of seals, whales, and dolphins. Greenpeace ejected him for being an overzealous activist with purported militaristic tactics. Starting his own organization, the Sea Shepherd Conservation Society, Watson has sunk illegal whaling ships, stopped Canadian seal hunts for ten years, and permanently halted sealing in the British Isles and the killing of dolphins on Iki Island, Japan. This documentary witnesses his latest campaigns and explores the personal and environmental history of this controversial marine conservationist.